Groove depth variability < 3 µm over 450 mm dia. Load capacity 454 kg | 1,000 lbs. Coning error 1 nm/mm | 1 µin./in. Radial stiffness 525 N/µm | 3,000,000 lbs./in. Axial stiffness 875 N/µm | 5,000,000 lbs./in. 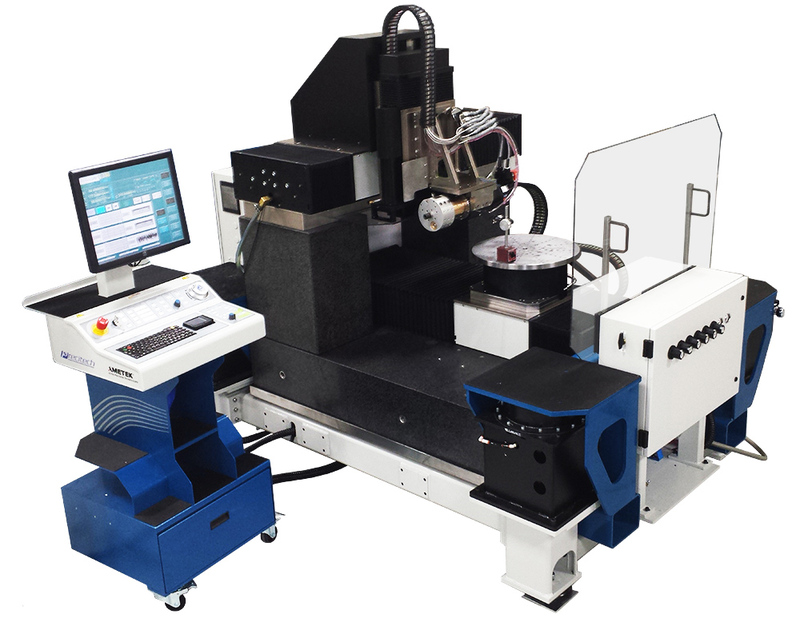 UPx™ machine tool control featuring advanced Motion Wire architecture. Hydroround rotary axis Precitech’s rotary axis is the stiffest in the industry. The Hydroround rotary axis comes standard on the Freeform® MGG enabling variable angle machining. Nanoform X style operator console All of the most popular ease-of-use features of the Nanoform® X style operator console come standard on the Freeform® MGG. These include convenient storage for all standard accessories, programmable soft keys, and both jog wheel and directional arrow axis control. UPx Integrated diagnostic tools Precitech’s innovative UPx control system enables the next level of process optimization. The QNX operating system features true real-time connectivity between the user frontend and machine control. This enables many unique diagnostic tools and software functions such as the ability to monitor following errors and vibration sources while the part program is being run. TMC MaxDamp vibration isolators TMC, also an Ametek company and vibration control experts, helped to design the vibration isolation system on the Freeform® MGG. The built in MaxDamp® high performance vibration isolators optimize the Freeform MGG® for ultra precision machining. Freeform MGG Vertical Axis The Freeform® MGG is a true freeform machine and it’s potential applications are virtually limitless. Freeform® MGG features the same vertical axis as Precitech’s industry leading Freeform® L diamond turning machine.